In a nutshell:Jack of all trades, master of quite a few – when it comes to taste. 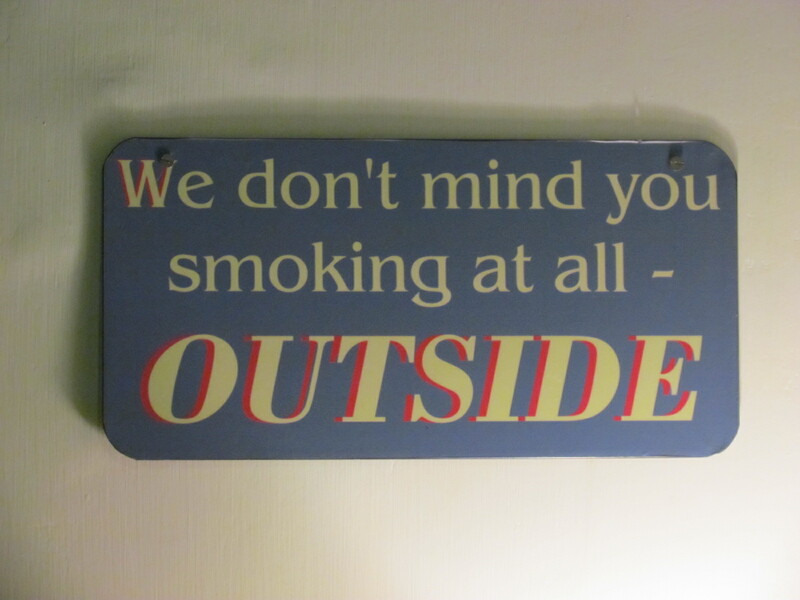 Service & Ambience is as fun as it can get. The innovative menu card bound with a nut & bolt!!! Right from the time u enter the place to the time ur taste buds experience ecstasy, u feel that ‘someone’ has put some real brains into this place & a lot of effort post that. Really impressive – This place has a long way to go (provided they market themselves a bit better than they currently do (Currently 90% people in Gurgaon do not know about the building in which they r situated & I wud say 99% people do not know about their existence.). Music was peppy, not to loud, not to mellow. Very Enjoyable. We cud have a good chat with friends for the two hours that we were here. 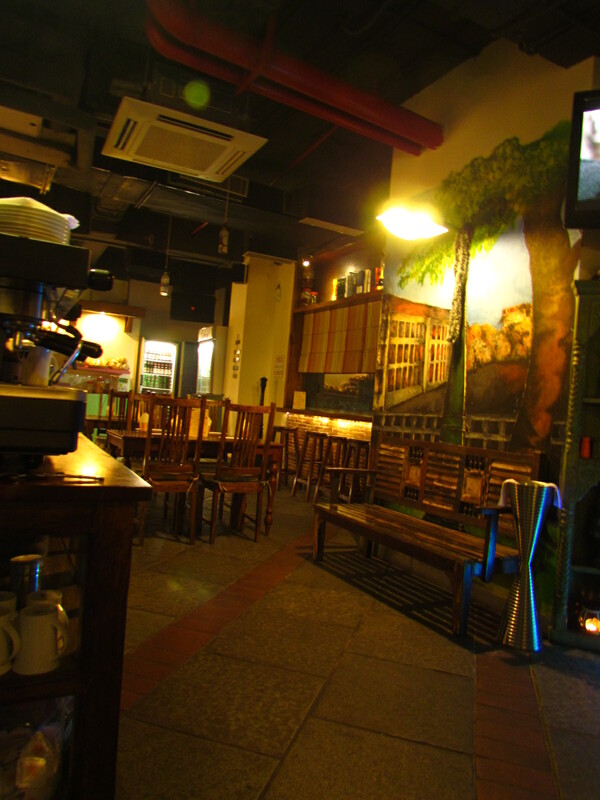 The place had a very smiling & interactive staff & they exuded lot of warmth. They added value to the evening. 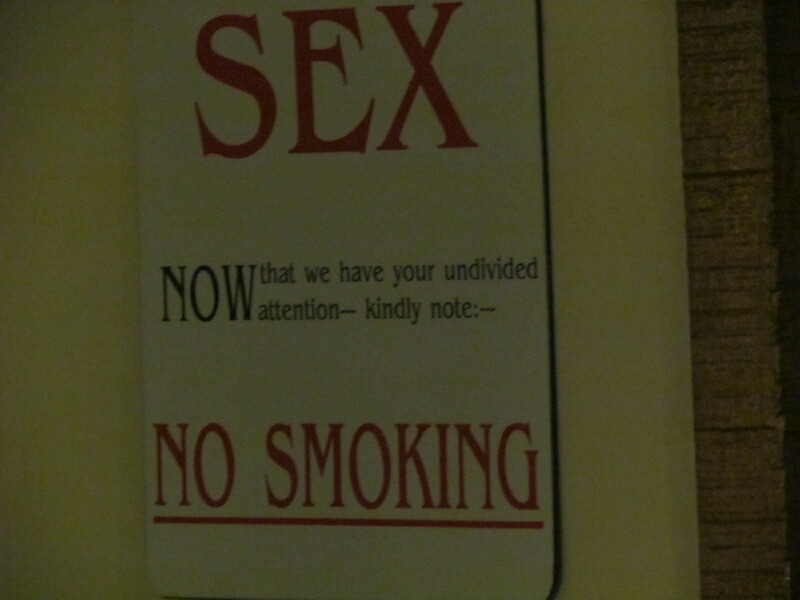 The walls had tons of funny messages – some of which cud induce u ROFL!!!! 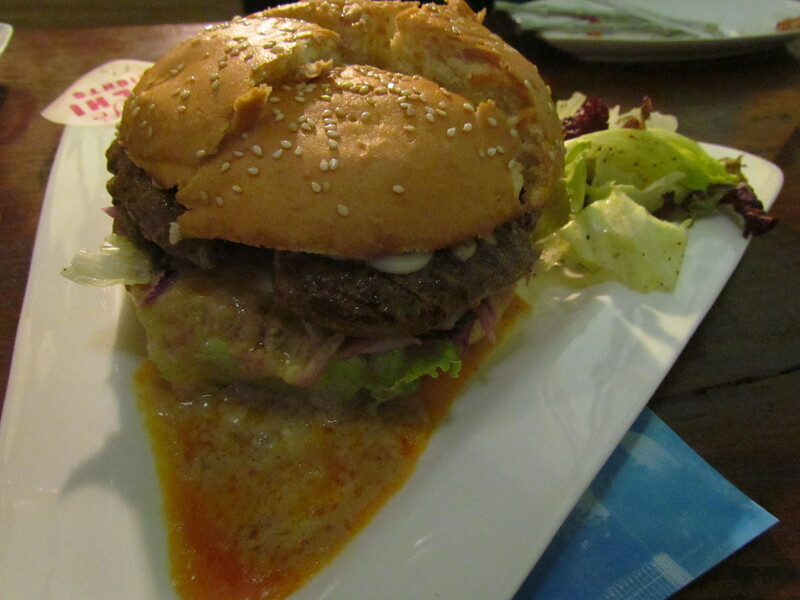 We enjoyed some excellent Cheddar cheese & beer soup, Mindblowing Juicy Lucy burger – bigger than the biggest burger I was ever served, Ok Ok minced lamb pani puri & a super good prawn dish Gambas al Ajillo. Saw in the menu ‘aphrodasiac smoothie’ – we did not try it though…ha ha. 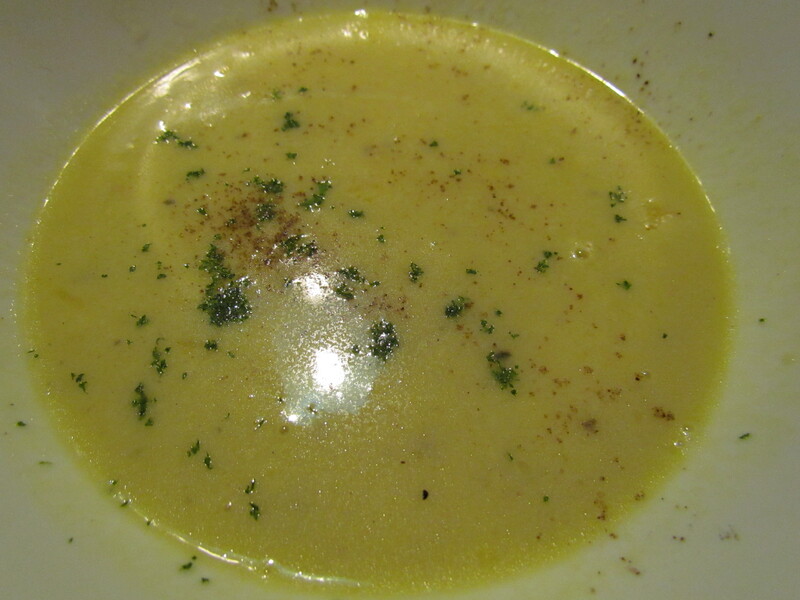 We started off with a very interesting soup – Cheddar cheese & beer soup. A thick ‘n heavy soup that was just too tasty – beyond expectations. I am not a big fan of ‘food cocktails’ unless they r real good. However, we friends cud not resist trying ‘Pani puri with minced lamb’ after we spotted it on the menu card – it looked to be pretty interesting & innovative. 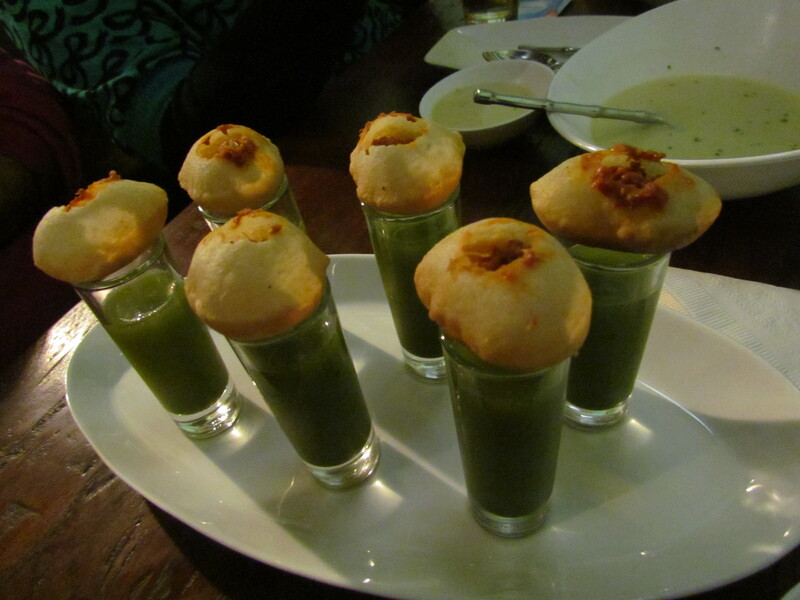 However it turned out to be a funny mix of two things that cud not make up a story – the stuffed pani puri sans the pani tasted good, the pani tasted good but together they did not really gel together – I wudnt say it was very bad but it was quite suboptimal. Post the ‘not so great experience’, came Gambas al Ajillo – a Spanish dish in which prawn is cooked in garlic & white wine with a hint of saffron butters. Mindblowing good. The prawn was a real show stopper that evening. Something in the burger that adds a cool twist to it making it one of the best hamburgers I have recently had. Initially I though it wud b the patty. So tasted the patty separately – the patty was very good but it was surely not the magic ingredient that added the twist. The word ‘Huge’ to describe the size of the burger, is an understatement – it is ‘mammoth’ – almost the size of a scooty tyre!!! 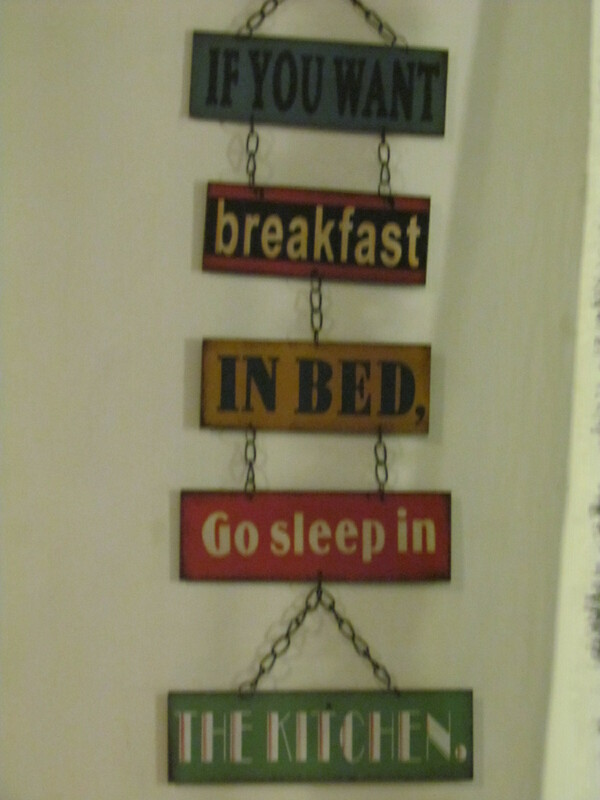 Order one for two & order more if u r still hungry. A request to serve it into two parts is obliged with a smile. My friends washed this down with a ‘Angry Martini’. Pretty interesting stuff – Vodka, Coriander & green Chillies & some more ingredients. I took a sip – It was on the right direction but something was missing – yes, the punch. So they asked for some slit green chillies & muddled it into the drink. The drink surely got better & u know what – it kept getting better over time till the glass ended. 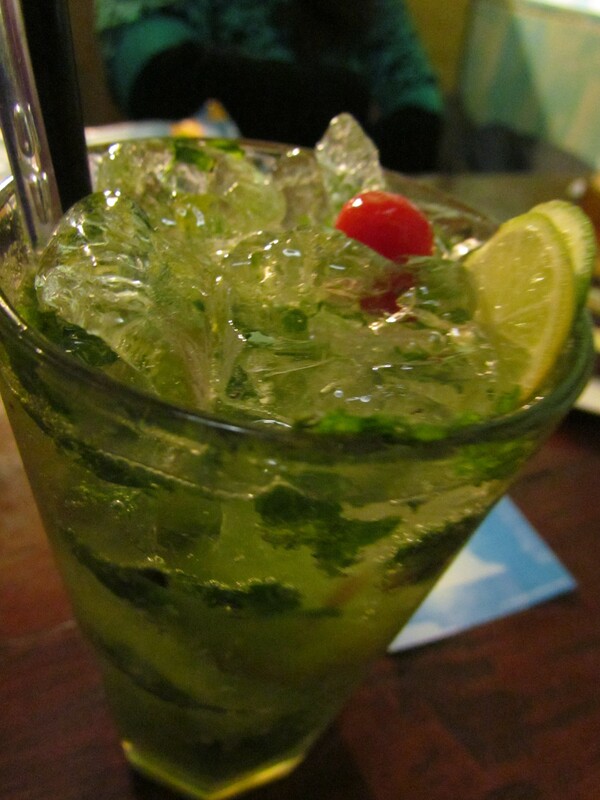 I asked for a virgin Mojito & that was super good – strong flavors & taste of mint & lemon – thoroughly enjoyable. On our second visit to this place, we tried some of the favorites from last time & some new dishes. 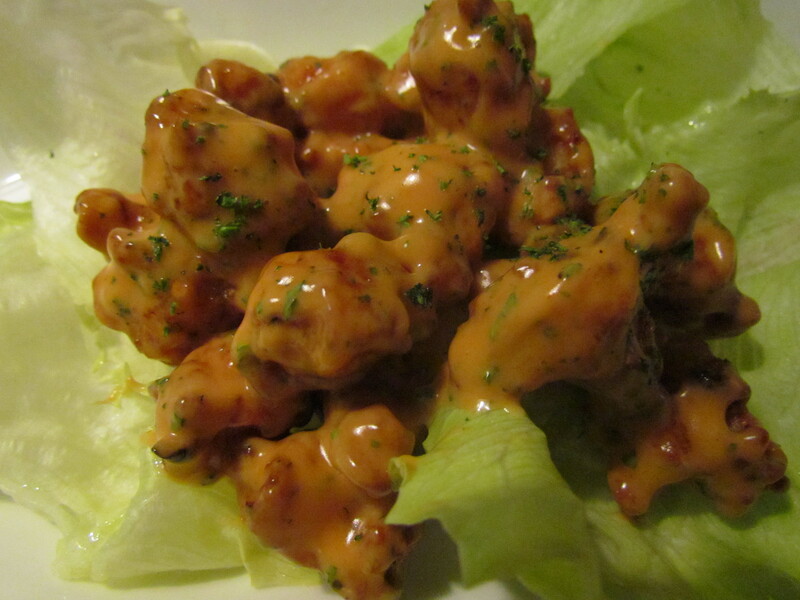 We tried a prawn dish called ‘Crispy Rock Shrimps with Sriracha mayo’ that turned out to be wow. Batter fried Shrimps tossed in Thai Sriracha mayonnaise sauce & lemon. 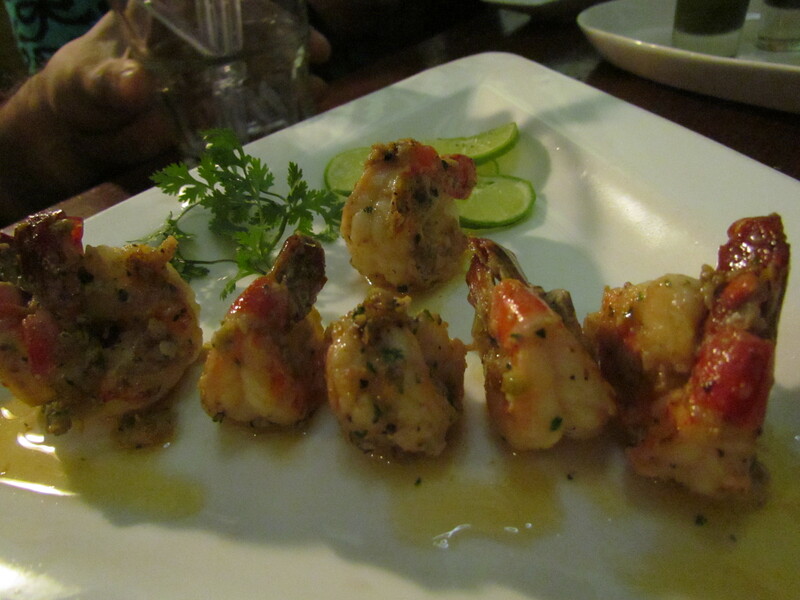 It was crispy outside & soft inside – good, flavorful prawns. This is coated with an excellent sauce whose taste was a curious combo of sour, hot, sweet & salty!!!! This was served with fresh crunchy iceberg lettuce. 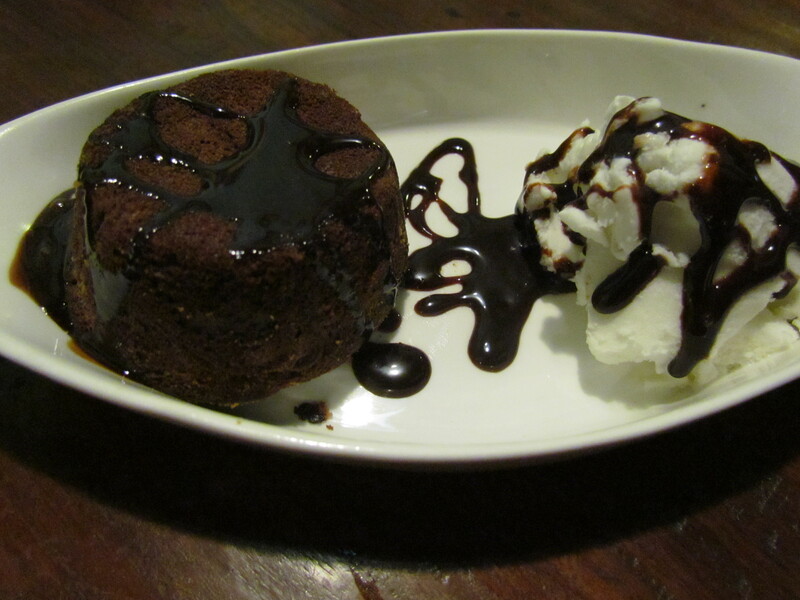 For dessert we tried Chocolate fondant with brie cheese, which we were told, is freshly prepared after u place order. It was an intense dark Chocolate cake with molten chocolate inside. A vanilla ice cream was served along-with. Very enjoyable. 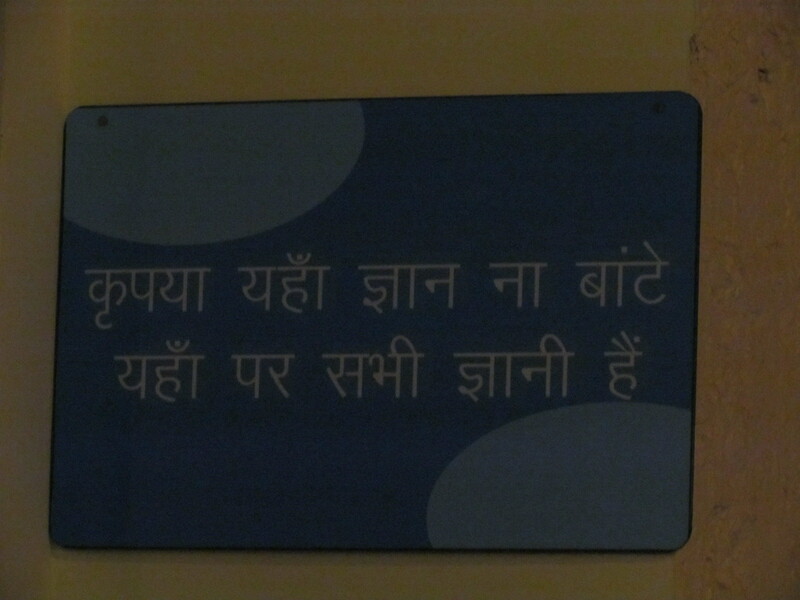 The menu card is long & YUMMRAJ will still pay a few more visits.So stay tuned in Boys & Gals……………more coming up. On day 3, we reached the Restaurant tired after a long day’s work. 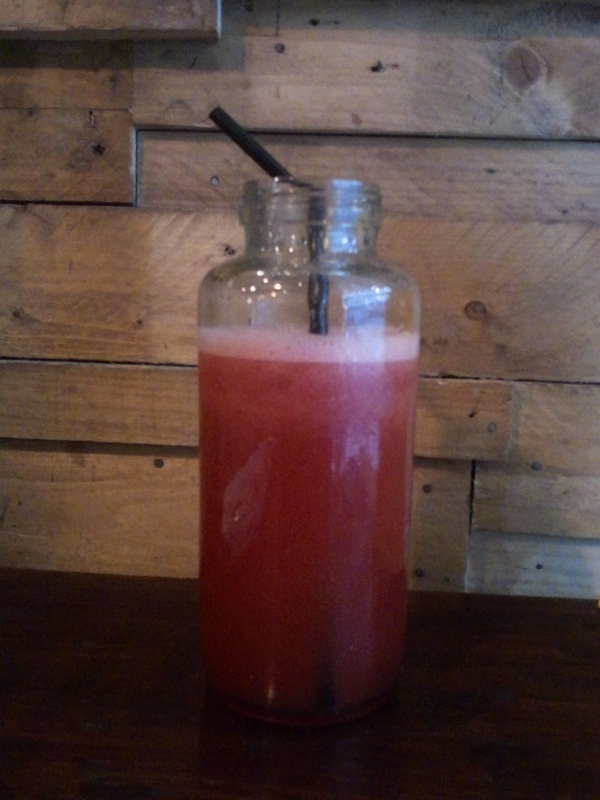 So we ordered a long drink that looked interesting on the menu card – watermelon, celery & pomegrenade juice. As the drink arrived, we were pleasantly surprised to see the 3 different shades of red fresh juice, frothed on the top. Instead of a long glass, this was served in a bottle – not the ‘drink from me’ kind of bottle but a storage kind of bottle.Pretty quirky & interesting idea. Taste was good inspite of the pomegrenade not making its presence felt. Maybe it wud b a good idea to chop off the pomegrenade from the list in future. The Juice had an enjoyable aftertaste of celery. Overall, keeping this debate aside, it was a pretty refreshing drink. We ordered two dishes – a prawn based starter & something that we searched all winter in Gurgaon without much success – Fondue. While we were waitin for the fondue to come, we were asked to shift to a bigger table coz the fondue was ‘elaborate’. We said we r good. & requested them to serve the shrimp & fondue one after the other. This was the third shrimp dish that we were having at cafe delhi heights. While we loved the other two, this one was also very cool. This was not the best among the 3 – I wud say Gambas al Ajillo is the best. The other two are almost equally good but very different from each other. The shrimps came with herbs, mint & freshly pound grains of black pepper along with sautéed veggies – zucchini, brocolii & also a great mashed potato unlike the bland version at Crown River Wetherspoon, London Heathrow terminal that I always keep referring to. 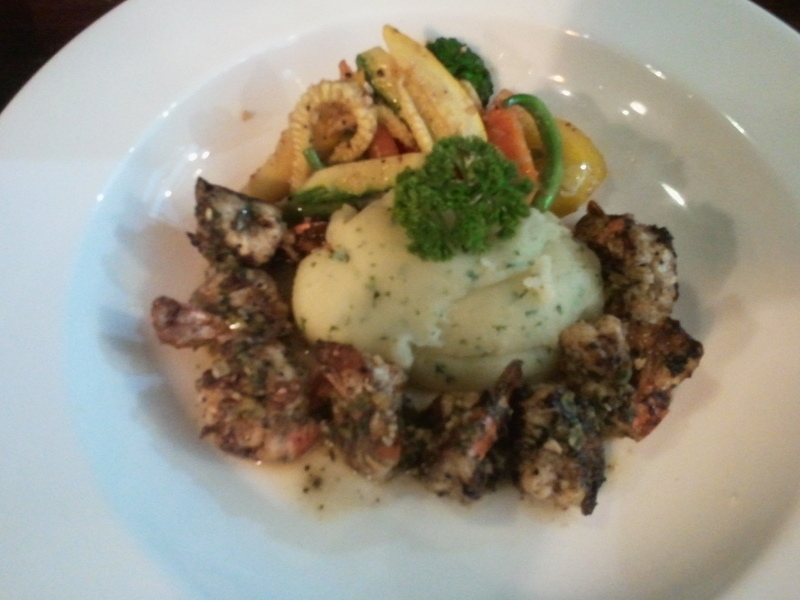 The prawns cud also be had dipped in an interesting amazing sauce that goes with this dish – called citrus sauce. The taste was not citrus as the name suggested but was buttery instead. Rank of this dish wud be No. 2 or no. 3 if compared to Gambas al Ajillo. Finally came the fondue. The fondue was slightly runny & that meant the cheese wud not stick to what u wud dip into it. 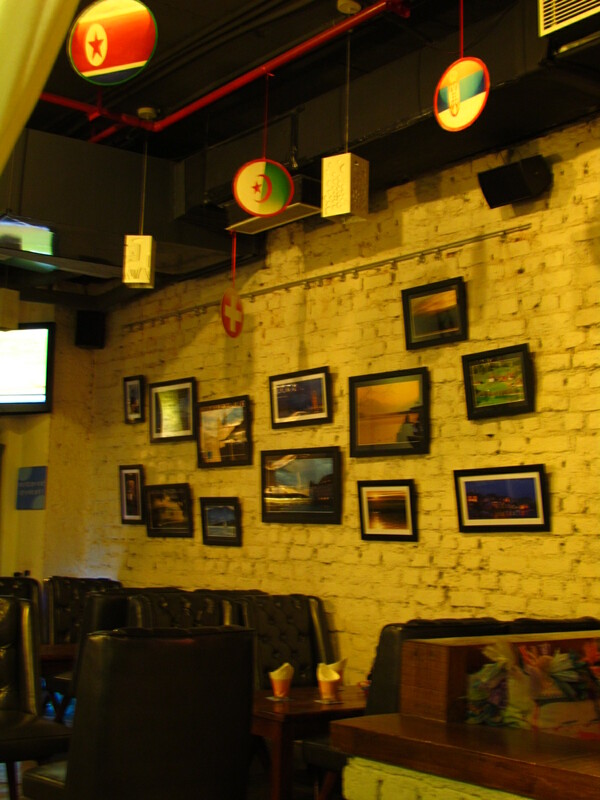 This however turned out to be surely better & thicker than Oak Tree, Supermart, DLF Phase 4. The Cheese of the Fondue had great flavor & also had a bit fermented feel to it. The most unexpectedly tasty accompaniment turned out to be broccoli which was just too good. It had been made perfectly – charred at the corners, perfectly seasoned & grilled, & it caught the cheese the best due to its structure. The broccoli was in fact better than the grilled chicken. The chicken happened to be was grilled, charred & hence crispy at the corners. The Grilled chicken was quite soft & almost juicy within. 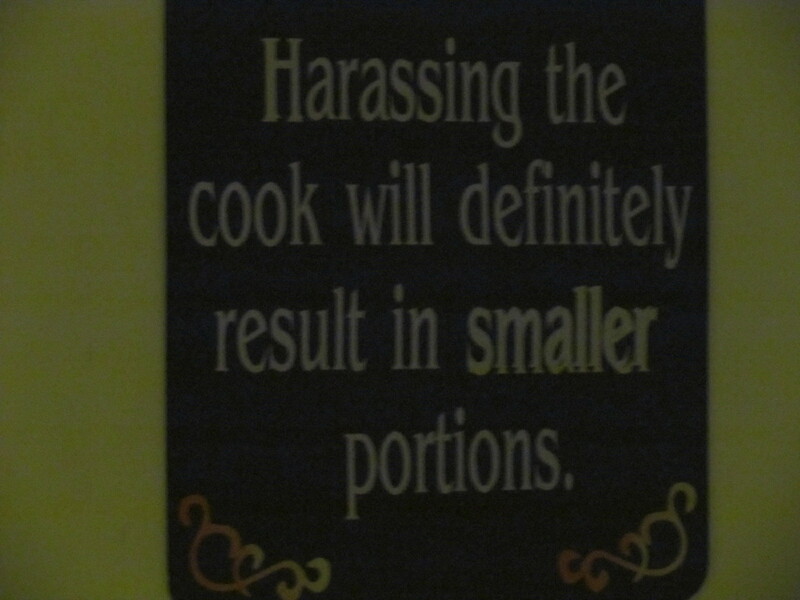 But the guy in the Kitchen forgot to put proper salt – so overall it became suboptimal. So kind of u have to compromise as a ‘salted food’ vs. ‘salt sprinkled from top food’ are never the same. The Mushrooms were nice & the croutions were good. The croutons were a bit big for a comfortable bite though. The Bell peppers were good but not great. I have surely had better sautéed bell peppers in other places. These ones were a bit overcooked & hence had lost the crunchiness. Olives were good & nice with a little filling inside. Overall nice feeling post eating this & I wud rate this dish 3/5. What turned out to be very interesting was the lettuce at the bottom of the glasses in which the dips were served – Whatever was there on top, the juices flowed down to the lettuce & they obviously tasted different due to the different flavors & tastes of the dips. Unintended, but really good. 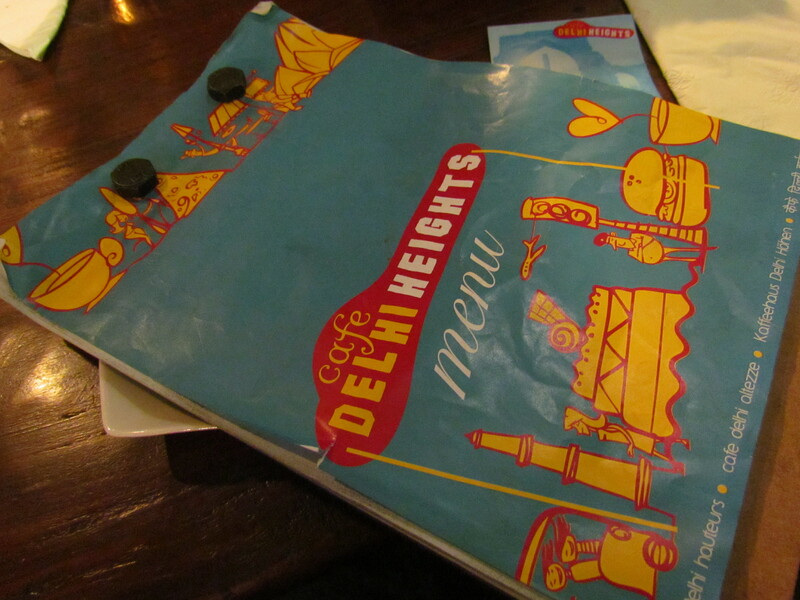 Look forward to even more innovative dishes at Cafe Delhi Heights. Look forward to updates of Day 4 & 5.